Your business is growing and with that growth you're dealing with more orders, higher customer demands and increased competition. If you’re feeling out of breath trying to catch up, then your systems are feeling stressed as well. The way your people work is changing and and you may be worried about the complexity of a more robust solution. There's no doubt that QuickBooks and Peachtree are very easy to use, but a more powerful solution for your business is waiting, one that works the way you do, improving productivity while scaling to fit your growing requirements. While you were busy managing the growing demand for your products and services and meeting the increasing needs of your customers, you may not have noticed you are quickly approaching user or transaction limits in place within your QuickBooks software. Now is the time to begin the search for solutions to manage the next chapter in your business. The best solutions for business are simple, usable and flexible—and they're also from Microsoft. Microsoft Dynamics gives small and mid-sized businesses, like yours, complete control over core business processes. Our business management solutions are easy to use and easy to deploy so you can quickly, simply and finally transcend the limits of your overworked and undersized accounting software. People get it. 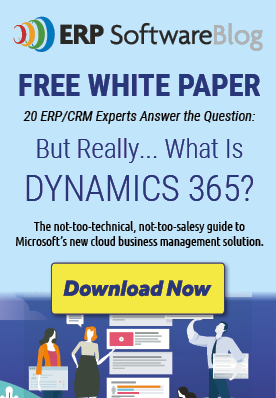 Microsoft Dynamics looks and works like Microsoft Office. That means everyone can jump right in and get to work. It's on your terms. With Microsoft Dynamics, your team can work when and where it works best—at the office, at home, or on the road. Cloud and on-premises deployments give you the flexibility to choose what’s best for your business. It reduces your risk. After decades of experience and thousands of successful projects, our local implementation partners are there with you every step of the way. With RapidStart Services, implementations can take less time and less money than going through a manual setup. And you can import data from your legacy accounting system, so you can be up and running in fewer hours and with less risk. Join us next week when we explore the next growing pain: your most valuable asset not living up to its potential.. Until then, visit our website to learn more about Columbus and our out-of-the-box implementation offerings to fit your small and medium sized business.